Ernie Kovacs, an American comedian and actor, once said that television was called a medium because it was "neither rare nor well done.” His words may have rung true in the past, but with the advent of subscription based T.V. services, television has seen increased competition and investment as companies vie for consumers. Series such as “The Crown” and “ER” had production costs of around 13 million U.S. dollars per episode in 2018, signifying that the “well done” comment isn’t quite as appropriate these days. Additionally, TV is one of the most popular mediums in the United States, reaching around 88 percent of adults per week. Audiences are able to choose from a plethora of programs, with latest figures suggesting there are almost 1,800 TV stations in total. While young adults are still spending a lot of time watching TV, the number of hours per week has halved since 2012 from 25.5 hours per week to around 12.7 hours. Around 22 percent of U.S. based adults report that they are watching less TV now than they have in the past, and this trend is generally expected to continue. These falling viewership numbers don’t necessarily mean that people are watching less overall, just that they are beginning to turn away from traditional TV and move to subscription video on demand services such as Netflix. 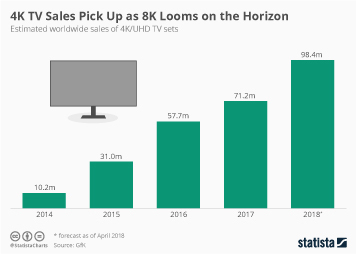 Consumers in the U.S. have been particularly quick to adopt new viewing technologies, but nevertheless, the number of TV households in the United States has increased over the last five years. The major issues with traditional television seem to be cost and convenience. Around 82 percent of adults state that they would prefer the ability to create their own pay TV package using only the channels that they are interested in. Subscription video on demand services aren’t the only services to benefit from the decline of television, internet usage has also rapidly increased as consumers find alternatives online. Advertising and subscription fees, which are the two most important sources of revenue for the sector, will continue bringing in profits for the television industry. Local TV advertising spending has followed a consistent pattern since 2010, and is projected to account for similar spending levels in 2021. However, in line with the increasing move to online television and entertainment, the share of online TV in TV advertising revenue has grown in recent years, from a 3.1 percent share of the revenue in 2012 to an estimated 5.6 percent in 2018. As with many forms of media both traditional and modern, consumers and providers alike can expect television to be ever more influenced by and linked to the internet in years to come. Air time revenue of TV broadcasters in the U.S.